In Leak Of Democratic Emails, Questions About Russia's Role : Parallels What's behind Russia's apparent hacking into the Democratic National Committee — and what could it gain by meddling in the U.S. election? "It's all about Hillary Clinton," says a Russian journalist. 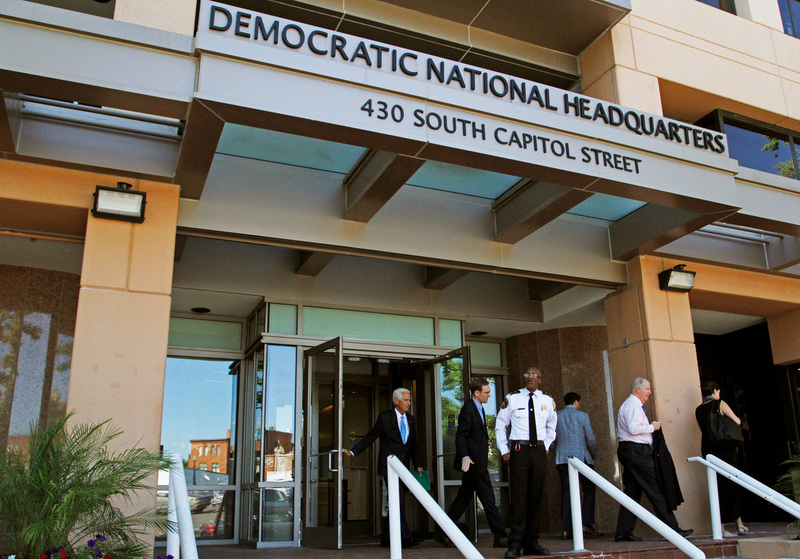 People stand outside the Democratic National Committee headquarters in Washington, D.C., in June. DNC staffers said publication of leaked emails in July was a Russian ploy to support the candidacy of Donald Trump. But, says a Russian investigative journalist, "I think it's not about Trump. It's all about Hillary Clinton." "When cases like this crop up, you have literally thousands of people who will seek to follow the breadcrumbs," he says. "And essentially, this has all proven consistent with the idea that this is a Russian hack." Investigative journalist Andrei Soldatov says the hack wasn't necessarily the work of Russian intelligence services. 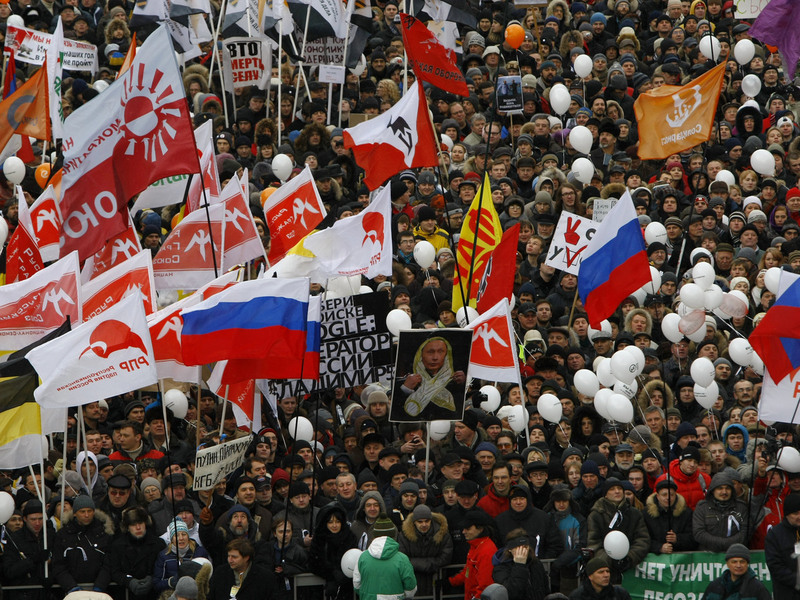 "It's much more complicated than that," says Soldatov, co-author of The Red Web: The Struggle Between Russia's Digital Dictators and the New Online Revolutionaries. "We have nongovernment actors, and they're really adventurous, really fast and they're really, really good." He says mercenary hackers give the government a way to deny involvement. Once the material had been stolen, though, Galeotti thinks the Kremlin took over. "The actual leak — the point where they did something with the information they gathered — now there's no question that that would be regarded as a strategic move, and would need to have had Kremlin sanction," he says. Demonstrators hold Russian opposition flags during a rally protesting election fraud in Moscow in 2011. Russian President Vladimir Putin blames Hillary Clinton for protests like this, which took place in 2011 and 2012. Russia's foreign minister, Sergei Lavrov, repeated this week that Russia doesn't interfere in the affairs of other countries. Recently he said, "We have witnessed a volley of Russophobic hysteria." He called the accusations "ploys to support one candidate and smear another." DNC staffers charged that the publication of the emails was a Russian ploy to support the candidacy of Donald Trump. But "I think it's not about Trump," says Soldatov. "It's all about Hillary Clinton." Soldatov says President Vladimir Putin believes Clinton is a Russia-hater who was behind anti-government demonstrations that took place in Russia in 2011 and 2012. And Soldatov says this U.S. election is important for Moscow because America's next leader could determine whether economic sanctions against Russia will be lifted. "And everybody in the Kremlin believes that if Hillary Clinton is in the White House, it will be absolutely impossible to get the sanctions against Russia lifted. So in a way, it's a question of national security for Russia." Galeotti thinks the key purpose with the DNC leaks is to divide Clinton's political base by showing that top party officials worked to freeze out her primary opponent, Bernie Sanders. The Kremlin's idea, he says, is to create the impression that politics in the U.S. is manipulated just as much as in Russia. "What they're trying to do is build a kind of propaganda campaign not so much intended to win it allies and friends, but to always give the impression that everyone is just as bad," he says. By casting doubt on Clinton's legitimacy, he says, the Kremlin hopes to weaken her — so that even if she is elected, she may be less effective as a geopolitical opponent.